Biscuit is another winner in the Fur Real Friends toy range. Every child would love to have their very own puppy. Well now they can! Biscuit is an adorable life-size golden retriever who is so like a real dog that we're sure he'll become your child's new Best Friend. Your child will just love to show their friends all the things Biscuit can do! Just like a real dog he will listen to and follow your child's voice commands, like "sit up and beg" and "give me a paw". Highly innovative animatronics enable your puppy to respond just like a dog would in real life. Just like a real puppy, Biscuit can move his head and ears, blink his eyes, wag his tail and bark. Give him a treat and he will nod his head and whimper to let you know he's ready for his bone! Give him the bone and he'll sniff it and then chomp on his tasty treat. Biscuit also has an innovative ‘bark-back’ feature that enables your puppy to respond when he is spoken to! So go on, give your child the puppy they have always wanted and we're sure they will get hours of fun with their new Best Friend for many years to come! Find and compare the cheapest prices for Biscuit on the internet below. Every girl and boy dreams of having a puppy of their very own to love and care for. Now you can make their dreams come true! 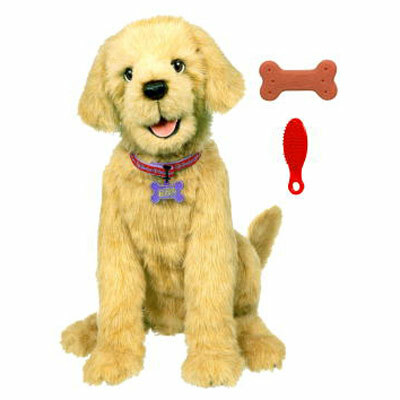 FurReal Friends has introduced another award winner with Biscuit a life size Golden Retriever puppy! Highly innovative animatronics enable this dog to respond to your child just like a puppy would in real life, giving your child hours of highly interactive fun! He moves his head and ears and blinks just like a real dog. Biscuit responds to your childs commands and even Barks when spoken too! Your child will have endless hours of fun with their new Best Friend and will love to show all their friends just what their puppy can do! Tell Biscuit to give you his paw and he’ll raise his right or left paw! Ask him if he wants a treat, and he’ll nod and whimper to let you know he’s ready for his bone! Feed him his dog "bone" and he'll sniff it before "chomping" away on it. Biscuit will even “shake” at your command, lifting his paw to your hand—or sit up and beg – just like a real puppy! Your child will love to interact with this adorable life-size golden retriever and he is sure to become your childs' new Best Friend! Just like a real dog, Biscuit can move his head and ears, blink his eyes, wag his tail and bark. He can also sniff his ‘bone’ and chomp on his tasty treat. He's so fiendly that he will wag his tail and bark to let you know he's ready to play! Biscuit has sensors located behind his ears, on his head and on his back enabling him to respond to your child's touch. They only have to pet their new best friend and Biscuit will wag his tail to show his delight. In addition, Biscuit has an innovative ‘bark-back’ feature that enables him to respond when he is spoken to! Just like with a real dog, your child can adopt their very own puppy. Use the special adoption certificate to register your pet online and ensure that you and Biscuit will be friends forever! So what are you waiting for? 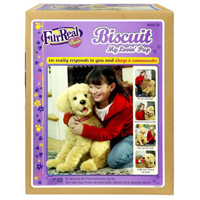 Get your child this adorable FurReal Friends Biscuit My Lovin' Pup today and give your child hours of fun for years to come! Fur Real Friends has a fantastic range of toys that we are sure your kids will love to own. As well as the adorable Biscuit there are the fantastic Butterscotch Pony and the Smores Pony. There is also the wonderful Squawkers Parrot. And now Fur Real Friends has introduced Kota My Triceratops. We are sure this baby dinosaur will become this years award winning toy. Remember we daily check prices at Argos, Asda, Littlewoods, Comet, Currys, Tesco, John Lewis, Sainsburys, Boots, HMV, Play.com, Amazon, Toys R Us, Woolworths, WH Smith, Marks & Spencer, I Want one Of Those, Mail Order Express, Firebox, Find Me A Gift and many more.